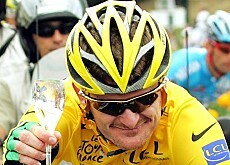 Despite the fact that he’s got osteonecrosis and is due to have a hip replacement, despite the fact that he totally cracked in the mountains, Floyd Landis came back to become the 3rd American to win the Tour de France along with the likes of Greg Lemond and Lance Armstrong himself. This means that in its 103 year history, Landis led to the 11th win by an American. It’s also interesting to note that there have been 12 Tours that involved an American wearing the leader’s jersey (but a total of 5 Americans doing this), 2 Americans have held the white jersey for the best young rider, 3 have held the green jersey for sprint points, and no one (this comes as a real surprise) has held the polka dog jersey for best performance in the mountains. There have been 43 stage wins by Americans and 130 American participants in the Tour, one which lives in Bend, Oregon, and a few of which who are Bike Friday owners. These are relatively small numbers, though. Undoubtably, this is why the French resent the Americans so much. The French have had 4869 participants and 36 wins. What the Americans have earned amounts to mere pocket change. They are just a minority. Minorities, unfortunately, do not do well in the Tour. I couldn’t find many non-European ethnicities represented in the Tour, a notable example being Fumiyuki Beppu from Discovery. Though I did find a South African, I found no one of African descent. Almost a century after Major Taylor‘s retirement, this is appalling, though some claim it has to do with access to resources. Equally absent are women though there was a women’s version of the Tour de France and there does happily exist a women’s Giro d’Italia (which is like the Italian version of the Tour de France). That’s right, there were only 6 Americans there. There’s a long way until the dream of other minorities in the Tour becomes reality. Keep on dreaming. of lots of useful information, thanks for providing these statistics.